Kale is really good for you. Being that it's very earthy tasting & slightly bitter, it's probably not high up there on your favorite foods list. The flavor reminds me of something close to broccoli rabe, or a brussels sprout. I love both of those vegetables & I like kale too. If you have never tried it, or want to give it another chance, this is a great dish. 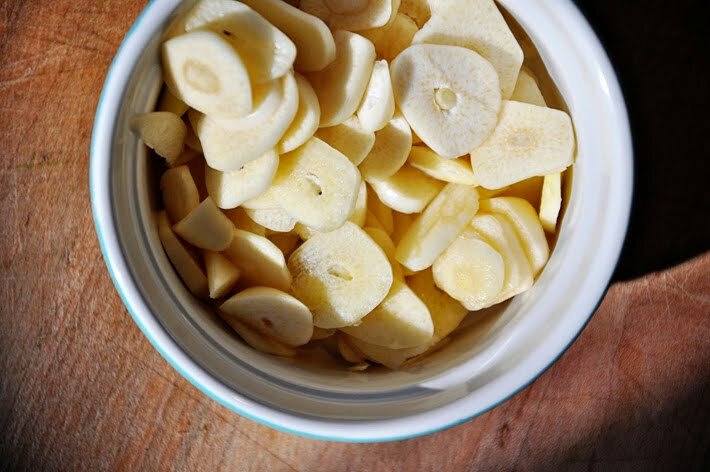 The braising refers to a slow, longer cooking method & it suits this vegetable very well. and wash in cold water. 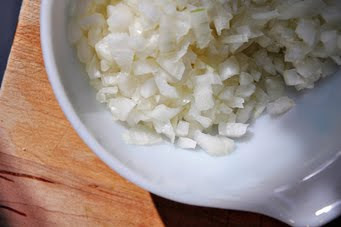 and thinly slice 8 cloves of garlic. 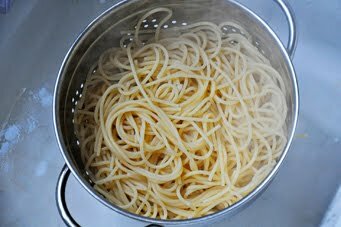 Bring a large pot of salted water to a boil & cook a 1/2 pound of spaghetti al dente. 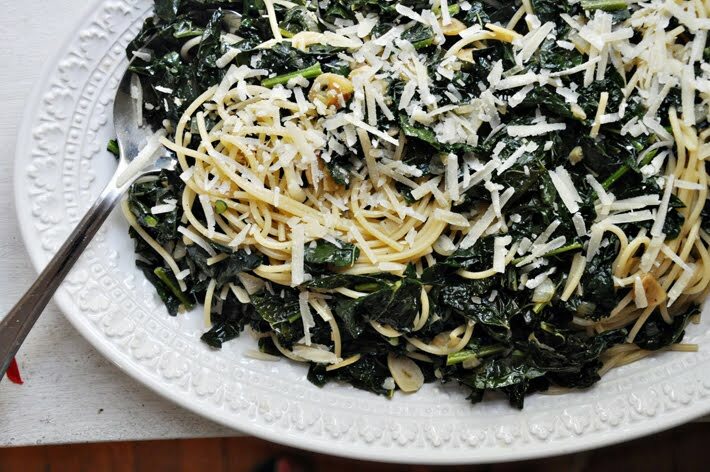 While the pasta is cooking, prepare the kale. and cook an additional 5 minutes, or until they are beginning to brown. 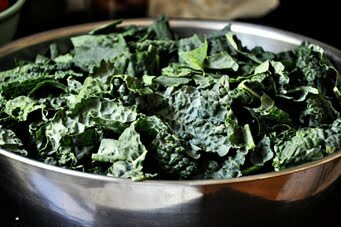 Add in as much of the kale that will fit, along with 1 tablespoon of olive oil. Toss over medium heat, until it begins to wilt. 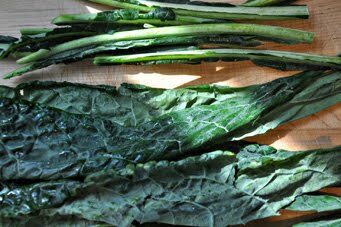 Continue adding any leftover kale until it has all been added & begins to wilt. Lower the heat to medium low & cover the pot. Cook for 20 minutes, adding water if it begins to dry out too much. 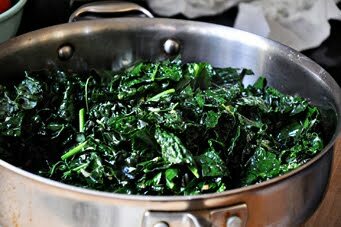 You probably won't need to, as the kale is cooking over a low heat & will release a lot of liquid as it cooks. When done, the kale should be tender & there should be enough liquid in the pan to coat the pasta. Add water as it cooks, if necessary. 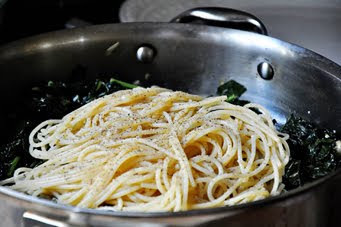 When the spaghetti is done, drain it & add it to the skillet with the kale. Season generously with salt & pepper & toss to combine. Transfer to a serving platter, sprinkle with grated Parmesan cheese & serve. 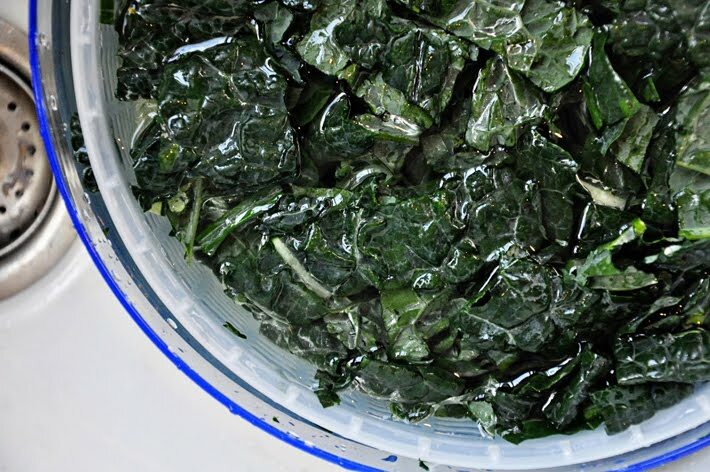 Swirl the chopped kale in cold water to wash & drain. Bring a large pot of salted water to boil. Cook a 1/2 pound of spaghetti until just cooked. 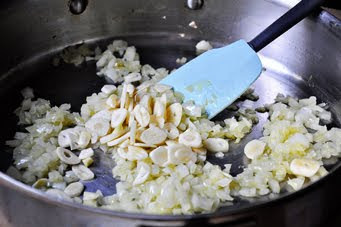 While the pasta is cooking, heat 2 tablespoons of olive oil in a large skillet over medium heat. 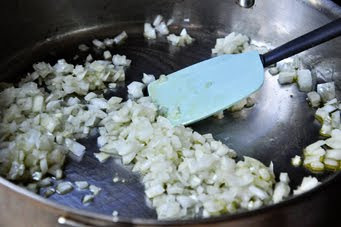 Add the onion & cook, stirring occasionally for 6 minutes. 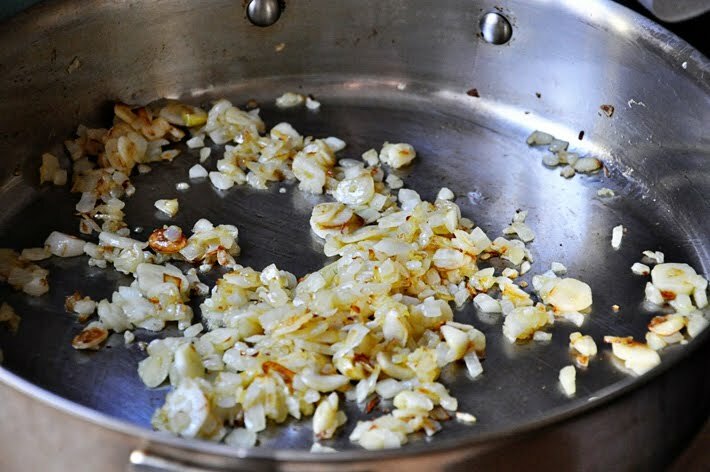 Add the garlic & cook an additional 5 minutes. 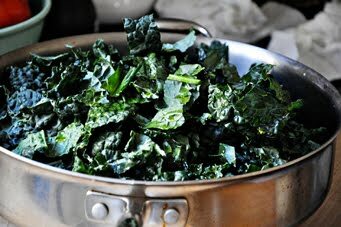 Add as much of the kale that will fit in the pan & the remaining tablespoon of olive oil. Toss the kale, and as it wilts, continue adding until it's all in. Add a splash of water, reduce the heat to medium-low & cover. 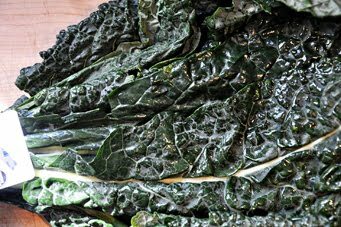 Cook for 20 minutes, or until the kale is tender. 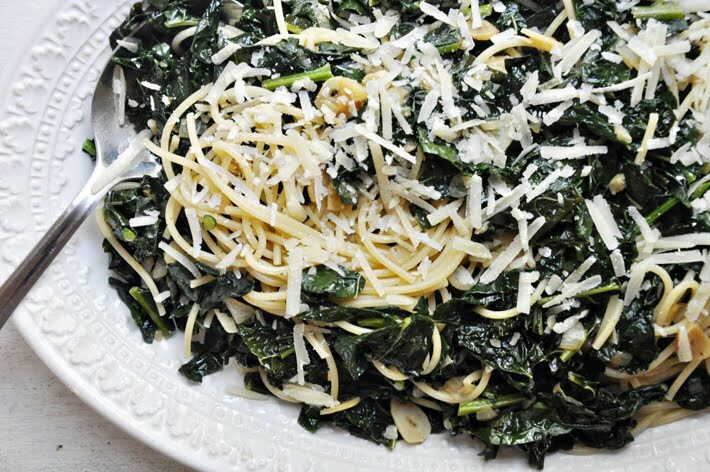 When the pasta is cooked, drain & add to the skillet with the kale. Toss to combine & transfer to a serving platter. Garnish with Parmesan & serve. yum! we used to love a dish like this at my favorite greek restaurant in philadelphia. i've tried many times to recreate it -- this might be the closest thin yet! You should grow kale in your garden this fall. Use starts now as it's too late for seed. Very easy to grow and frost tolerent. lauren~i planted butter lettuce. i'll have to look for kale. Happy 2nd Birthday to my niece, Penny ! !